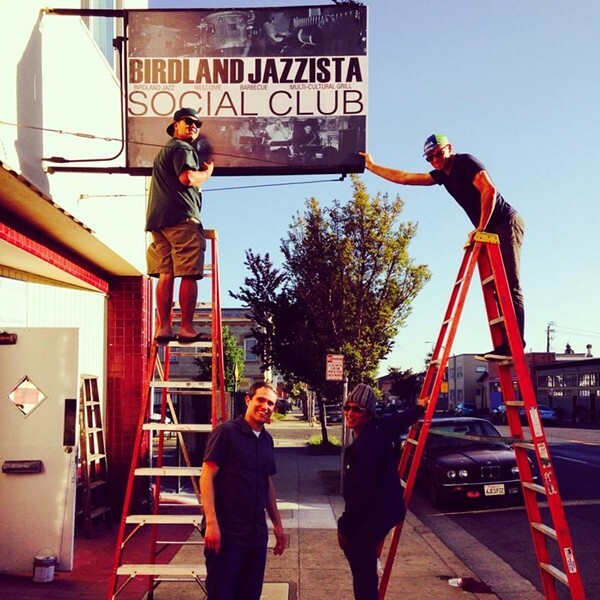 The official launch of the Birdland Jazzista Social Club's North Oakland venue has been pushed back to the first or second weekend of July, while renovations are completed on the former Tea Cakes cocktail lounge at 4318 Martin Luther King Jr. Way, located about three blocks from the MacArthur BART station. The new North Oakland site of Birdland Jazzista Social Club, which was founded by Michael Parayno (bottom right). In keeping with Parayno's vision of creating what he calls the Bay Area Art 'n' Music Project District (BAAMP), nearby businesses have started offering free music shows. Over the course of two weekends in May, three nearby businesses — the MLK Cafe, Marcus Bookstore, and Ray's Barber Shop — hosted a total of eight blues, jazz, and Latin jazz shows, each of which attracted about thirty to forty people, according to Parayno. A total of about six businesses plan to participate in the BAAMP District music series, he said, with some venues hosting musicians once a month, while others will do so as often as two nights per week. "We're going to try our best to at least create a five- or six-block jazz and blues district," Parayno said. 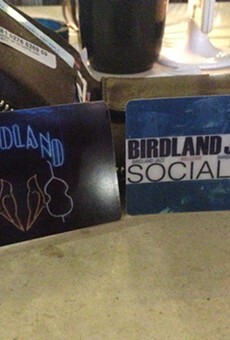 When Birdland officially opens, the space will showcase live music five nights a week for an anticipated $20 cover charge. 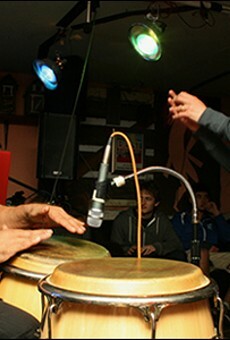 Current plans call for two to three music acts to play each of those nights, with blues on Wednesdays; salsa on Thursdays and Sundays; and blues, jazz, or Latin jazz on Fridays and Saturdays. The building will have "sprung" floors for dancing, as well as folding chairs and black couches (holdovers from the Berkeley garage). 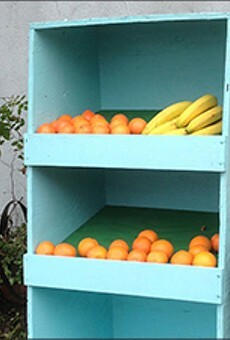 Birdland has long been known for its informal vibe and emphasis on community, and in keeping with that ethos, Parayno is encouraging people to bring food to the shows for potluck-style meals. Eventually, the Oakland building will include a cafe, "but the main thing is we want to start partying," Parayno said. Parayno said Birdland's programming will focus on local musicians, with occasional nonlocal guest artists. "We want to make sure local musicians get work," he said. In addition, Birdland will continue its emphasis on featuring student talent and young, up-and-coming musicians. Parayno also spoke of the need for more support for live music and more late-night shows in general. "There's more music in a strip mall in Manila than in the entire Bay Area," he said, adding that he wants Birdland to be "a wake-up call" to Oakland venues to book more music. "Birdland hopes to inspire a music revival in the entire city," he said. By the time Birdland's five-year lease is up, Parayno said he would like the neighborhood to look like a "proper art and music district" and that the energy and momentum will spill over into other parts of Oakland. "It can't just be about First Fridays," he said. "Hopefully, after five years, they won't need us." For more information on upcoming music performances, watch for updates to be posted to Birdland's website. For information on Birdland memberships, which include priority entry to Birdland events, discounts at participating neighborhood businesses, and access to community barbecues, go here.